A morel mushroom emerges from the Yosemite National Park forest floor the spring following a forest fire. Credit: C. Alina Cansler. "So many people love to harvest and eat morel mushrooms," Larson said, "but there is very little research that measures the abundance of morels after a forest has burned. We wanted to give forest managers concrete data on morel abundance." Larson and his co-authors conducted their study in the Yosemite Forest Dynamics Plot, a long-term research site located in Yosemite National Park. A fire burned the research site in September 2013, killing more than 70 percent of the trees. Researchers then surveyed for morels in May 2014 in 1,119 small sample plots within the research site. Where morels were found, researchers discovered most of the ground surface was 100 percent burned by fire. Morels typically are found close together, yet unevenly distributed across the landscape. According to Larson, burned white fir forests in Yosemite alone could produce an average crop of more than 1 million morels per year, a sustainable amount for recreational picking. "The magnitude of post-fire morel production, especially the first year after fire, clearly supports the park's current rule allowing people to pick one pint per day for personal use." At the start of their study Larson's team was surprised by how little research has been conducted on morel mushroom productivity. "We reviewed every published paper on post-fire morel mushroom productivity we could find," Larson said. "Amazingly, only three earlier studies - in Alaska, Oregon and British Columbia, Canada, provide statistically sound estimates of morel abundance after forest fires." Much is still unknown about where morels grow after a fire, so Larson and his co-authors also propose a conceptual model to guide future research that could explain the mushroom's spatial distribution in burned areas. 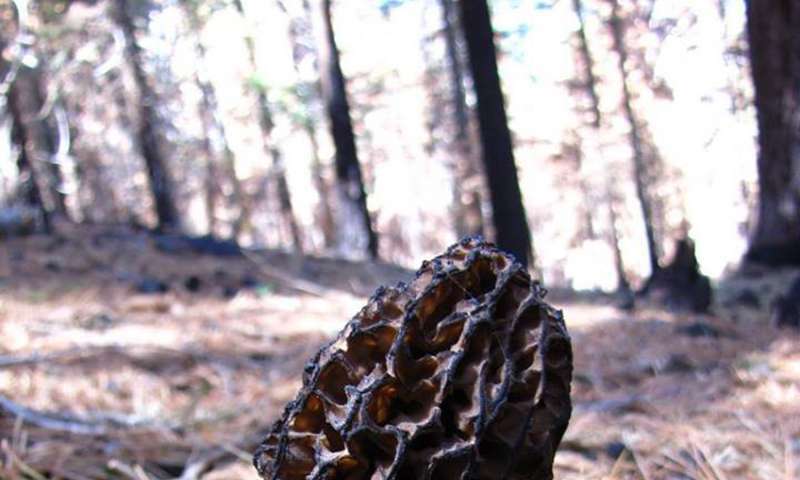 Their paper, "Post-fire morel (Morchella) mushroom abundance, spatial structure and harvest sustainability," was published June 27 in the journal Forest Ecology and Management.